Stator— In a rotating field alternator, the stator contains the armature. It is housed in the cast-iron yoke. It consists of laminated sheet steel cores. 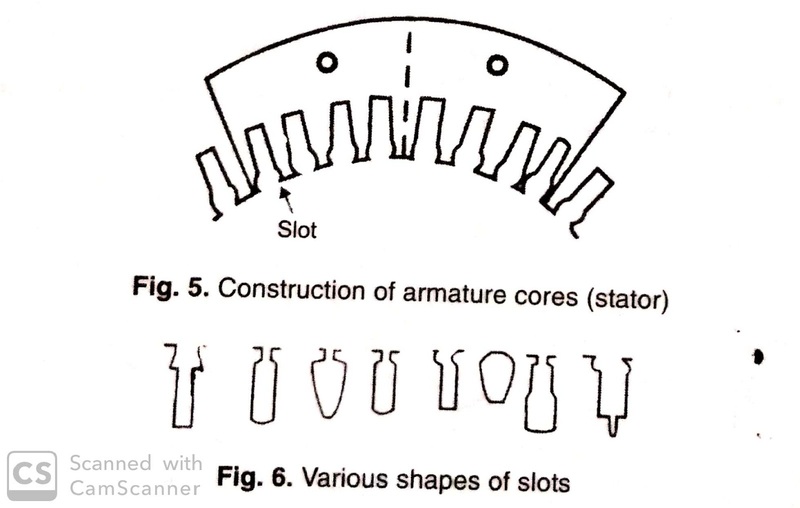 The slots are cut on the whole circumference of the cores, as shown in figure 5. The insulated with varnish or paper and tied together with nut-bolts, Then these are fixed on the yoke or frame. armature winding is placed in the slots. 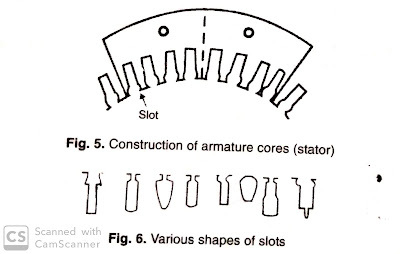 The slots may be cut in various shapes, as shown in figure 6. → What Is the Rotor? Rotor— The rotating part of a machine is termed as the rotor. here, It houses the field windings and the poles. 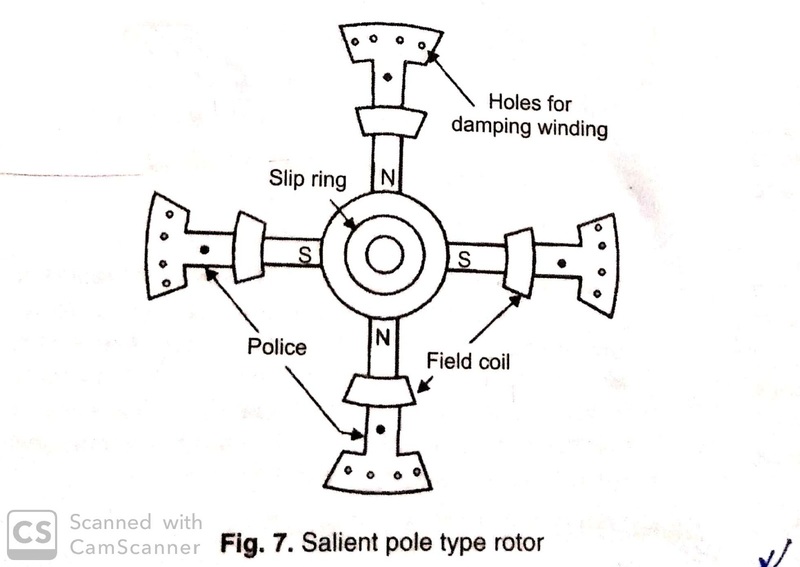 (I) Salient pole type rotor- In this type of rotor, the poles and the winding are fitted on the shaft, As shown in figure 7. Laminated cores are tied together with nut-bolts, To form the core. the pole-shoes are built up of steel or cast iron. The field windings are connected in series. D.C. supply used for The excitation of the field. (a). The diameter of the pole is kept greater than the length of the pole. (b). Two-third part of the cores is slotted, and the remaining one-third part serves as pole base. (c). These are employed with hydraulic turbines or diesel engines. the speeds are 120 R.P.M. to 400 R.P.M. (d). Laminated cores are used to reduce Eddy current losses. (e). Damper-windings are fitted on the poles ends to stop hunting. (f). This type of water is suitable for low-speed alternators such as water turbine alternator. 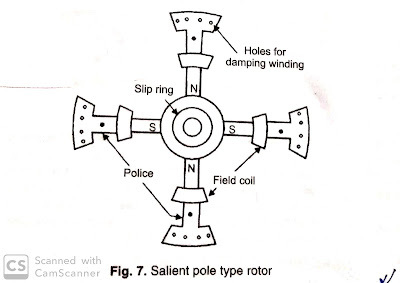 (II) Cylindrical poles type rotor- Its construction is similar to that of a DC armature. It is usually made up of the solid steel core. Slots are cut all around its circumference in which field windings are placed, as shown in figure 8. (a). It is light in weight, hence it can rotate at high speed. (b). It has low windage losses. (c). Its diameter is less in comparison to its length. (d). It has only two or four poles, up to 50 MVA( Mega Volt Ampere), two poles are used, and up to 200 MVA, Four poles are used. (e). The speed employed is 1000 R.P.M. ( Revolution Per Minutes) to 3000 R.P.M. (f). Batter in dynamic balancing and quieter in operation. Slip- rings— Slip-rings made up of copper or brass are used for the excitation of the field with D.C. Slip-rings are mounted on the shaft of the rotor and they make sliding contacts with the brushes. Exciter— The device used to excite the field is termed as exciter'. A D.C. Shunt or compound generator of 120 to 250 volts is used as an exciter. In small alternators, the exciter is mounted on the shaft of the alternator. A variable resistor which is called a field regulator is connected in series with the shunt field as shown in figure 9, To control the speed of the motor.